Stencils for walls are a simple way to create instant glamour; no matter where you live or what conditions your walls are in. They are versatile and come in hundreds of different patterns or motifs to suit your home and decorating style. This post concentrates on white paint, as either the main wall color, or used as one of the colors for these cool wall stencil ideas. If your walls are painted with white paint, a quick stencil will instantly update your look. 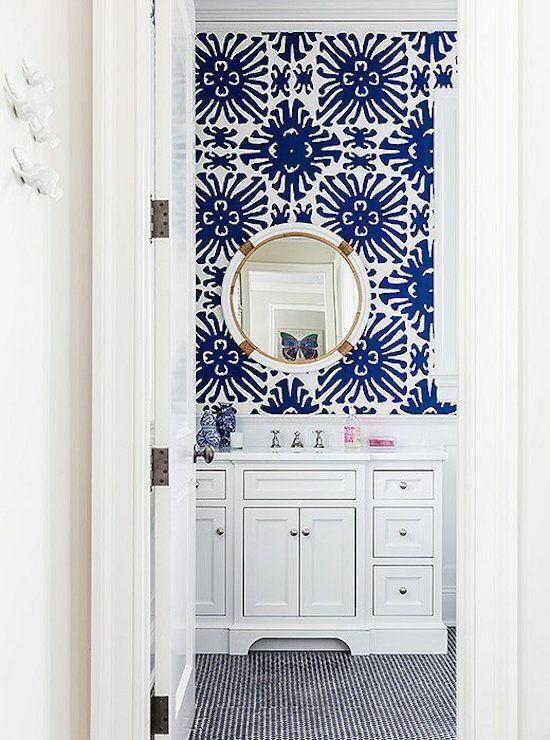 Dark walls can also benefit from using stencils. 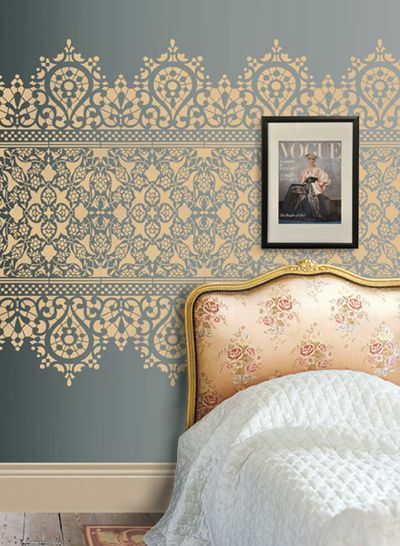 Create drama in the dining room, or down the hallway passage, or soften your bedroom with romantic soft flower stencil. The simple flower stencil below lightens the dark wall; helping to draw in natural light from the window deep into the room. It adds interest, while keeping the drama of dark painted walls high. Perfect for a small room where space is an issue and a cheap way to make an impact. White paint is easy to find, cheap to buy and almost every household has some lying about. If you prefer your walls plain, there are posts on how to use stencils for furniture here, floor paint stenciling here and wall stencil tutorials here. Whether you are new to painting or a seasoned DIY'er, walls stencils are an easy way to create home decor impact with little experience for a minimal cost. Follow the wall stencil tutorial above to get the basics. Note: If your walls are less than perfect, stenciling them can cover a number of sins you, and your guests, will never notice. Walls with uneven surfaces are perfect to add stencils, but, if you walls have glossy paint, every crack and blemish will show, and adding stencils won't help. Flat paint is the best product to use on less than perfect walls. So many home decor styles can be created using basic white paint, stencils for walls, a roller and a little imagination. You can lighten a dark, dense wall, paint on a blank white wall or add stencils to your furniture or floors as accessories to your existing home decor. For a streamlined, professional look, choose stencils and paint colors in keeping with the rest of your decorating style. Whether your room needs a little freshness, glamour or drama added to it, wall stencils can create amazing effects. A lot will depend on the stencil you choose and the color combinations for your wall. To create the wall below, add your stencil inside a bordered frame. This adds style and creates a feature in a featureless wall; looking more like wallpaper and drawing the eye into the next room, making it look bigger. 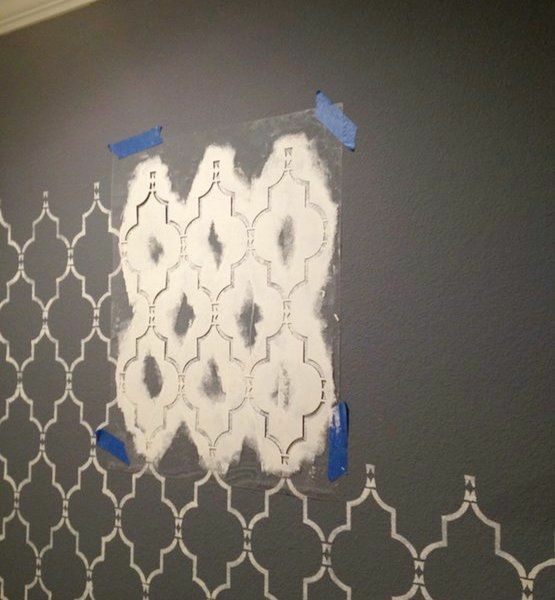 Here are more wall design effects you might find helpful before you make your final stencil selection. You can also create a similar look in your garden; focusing on one wall or pathway. Within hours you can easily create a feature wall, an amazing wall paper look or wall feature to make your home feel suddenly new and fresh again without breaking the bank or waiting for weeks for results. White paint is incredibly versatile; adding stencils to your walls, adds a quick layer of design and you can have a new decor style that looks classic, minimalist, or mid-century. If you would like more on how to decorate like a Rock Star, join our list here. See you on our Facebook page!